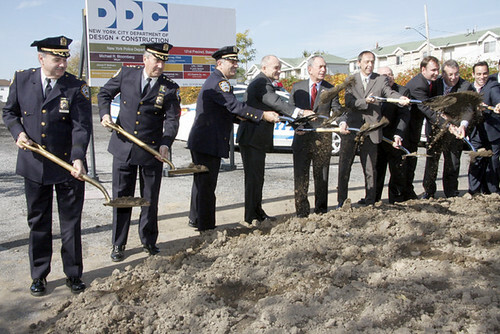 Top brass breaks ground on the Rafael Vinoly-designed 121st Precinct Stationhouse in Staten Island. City-funded architecture work is becoming scarce, if the DDC’s latest list of Design and Construction Excellence firms is any indicator, so it’s heartening when public projects promised during the boom times move into the construction phase. Today, Mayor Bloomberg, Police Commissioner Kelly, and DDC Commissioner Burney broke ground on the Rafael Vinoly-designed 121st Precinct Stationhouse, which was unveiled in last year. 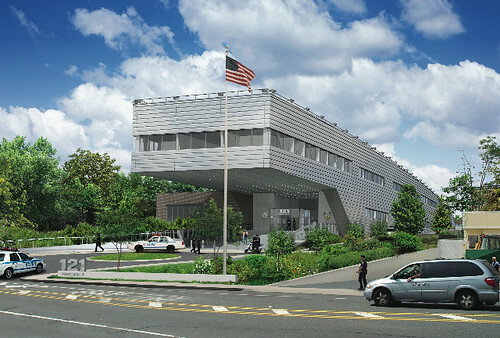 It will be the first police station built on Staten Island since 1962, and the first in the city to be built under the 2030 sustainable design initiative. The project is expected to earn a LEED Silver rating and to be completed in 2012. See a rendering after the jump. The stationhouse features a 90-foot cantilever out toward the street. The building's form was a response to its irregular site.